Private Banking professionals spend a signifiant amount of their time dealing with the most complex financial transactions. With that being said, they spend even more of their time dealing with, managing and attempting to influence an incredibly complex internal and external network of highly intelligent, highly competitive and highly demanding people. 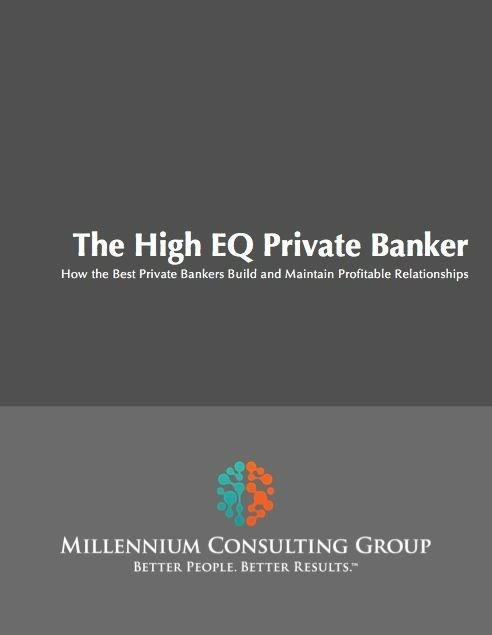 Our High EQ Small Private Banker workshop is designed to immediately and positively impact participant EQ levels by working with them to understand and develop the personal development and relationship development mindsets and skill sets of the most successful Private Bankers in the industry. This fast paced, highly practical and highly interactive program takes the EQ discussion beyond general theory by delivering industry specific functional best-practices that will challenge participants to elevate the quality of their personal growth and relationship development efforts. * Content Note - Millennium programs are highly customizable. Every client is different and every client has different objectives. All Millennium courses are tailored for delivery to match the strategy, client demographic, product mix and skill development needs of each client we work with. We work with you, leading up to the rollout of your courses, to customize content and specifically match lessons and approach to be the perfect fit for you and your team. All Millennium courses are available for delivery via instructor-led classroom session, webinar and/or train-the-trainer sessions.